SAN FRANCISCO (BRAIN) — Mission Workshop's new Rhake City Backpack is built to hold everything needed for work, play, and the occasional overnight. Purpose built pockets are designed for a laptop, iPad, phone, power chargers, keys, sunglasses, and water bottle. LODI, Calif. (BRAIN) — Williams Cycling, which began wholesale distribution to IBDs this year, in addition to its long-standing online consumer direct program, has launched three new carbon clincher wheel models, the System 45, 60 and 90 wheels. KIRKLAND, Wash. (BRAIN) — BikeFit is now shipping its Saddle Changer, an updated and much lower priced version of its previous quick-change seatpost, the SwitchIt. The Saddle Changer is intended for bike shops, fitters, and saddle demo operators, to quickly swap saddles on bikes. VENTURA, Calif. (BRAIN) — Balance Cycle Wear will donate $25 to the American Red Cross's hurricane relief fund for each sale of its new jersey. PHILOMATH, Ore. (BRAIN) — Softstar Shoes, a maker of handcrafted minimal footwear, has released a new model for athletic and casual wear, the Primal. BROOKLYN, N.Y. (BRAIN) — Brooklyn Bicycle Co. is making its first foray in to the cruiser market with the introduction of the Brighton 7-Speed Cruiser. The brand now offers nine bike models. 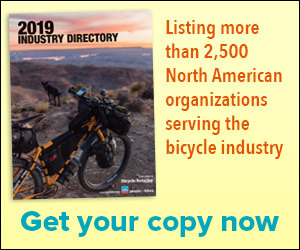 BOULDER, Colo. (BRAIN) — Bike industry journalist, adventurer and mechanic Nick Legan has written a new book for VeloPress called GRAVEL CYCLING: The Complete Guide to Gravel Racing and Adventure Bikepacking. BLOOMINGTON, Minn. (BRAIN) — Heller Bikes has released an updated Shagamaw model for 2018. The Shagamaw is a carbon hardtail built for 27.5-plus wheels. It will also accept 29-inch wheels with tires up to 2.5 inches. SAN FRANCISCO (BRAIN) — DZR has introduced two new limited edition shoes: The Reflective and The Valencia. The DZR clipless cycling shoes have variable flex shank technology, a sturdy heel stabilizer and recessed SPD cleat design that transitions from walking to riding. RAPID CITY, S.D. (BRAIN) — Strider is launching a new balance bike that quickly converts to a pedal bike when a child is ready. The Strider 14x Sport comes with the Easy-Ride Pedal Kit, which the company said can be installed in five minutes with one bolt. KONA, Hawaii (BRAIN) — American Bicycle Group's Quintana Roo is showing off its all-new PRsix Disc Series of triathlon bikes at the Ironman World Championships in Kona this week. FREEHOLD, N.J. (BRAIN) — JET Roll has launched three new tool roll models for the 2018 model year, including new designs for plus-sized mountain bikes. The new JET Roll MTB+ Dragon Lady and Balls 8 models are designed to carry plus-sized MTB and fat bike tubes, along with other essential cycling items. BOULDER, Colo. (BRAIN) — Sweet Protection's Delirious Jacket is made with Gore-Tex Active material, the most breathable fabric in the Gore-Tex product line. ROSEVILLE, Minn. (BRAIN) — Hed Cycling's new Vanquish 6 wheel feature an all-new tubeless-ready carbon rim. PLAINFIELD, Ind. (BRAIN) — Endura's MT500 Plus Overshoe was designed for cold, wet and muddy conditions. The overshoe has an open sole made from hardwearing rubber for flat or clipless pedals. The upper is made from nylon-faced neoprene rubber, with highly durable overlays. PORTLAND, Ore. (BRAIN) — Showers Pass has released a new line of Crosspoint waterproof gloves and socks, which will begin shipping Oct. 14. VOREPPE, France (BRAIN) — Time Sport is bringing out two new pedal designs this fall: The XPRO road pedal and the Speciale 12 enduro pedal. The XPRO is built off Time's Xpresso pedal design, with a wider platform and lightweight aerodynamic design. ZURICH, Switzerland (BRAIN) — MilKit, which sells a tubeless tire sealant valve system, is now launching a system to pressurize aluminum water bottles with air to inflate and seat tubeless tires. The Swiss company said its Booster system is less expensive than an air compressor and is portable. LAS VEGAS (BRAIN) — Lezyne's new Digital Drive Family includes road, offroad, fat tire and suspension handpumps with a newly designed integrated digital pressure gauge. The line also includes a standalone digital pressure gauge.